So How Far Apart Are the Yankees and Derek Jeter Today? Botta, who also covers the NHL for AOL Fanhouse, told the Times that he was informed his credentials were revoked because of management's concerns that he'd gone from "reporting the news to making the news." (He told the Post that this might stem from two occasions when he wrote that GM Garth Snow declined an interview with him.) Botta also said that Snow "hasn't been happy with me for a long time" and is "personally offended that I've criticized him, but I've praised him more than I've criticized him." 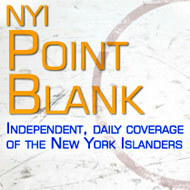 Islanders officials have not commented. In any case, Botta has since done a handful of interviews, including almost half an hour yesterday with Mike Francesa, or approximately half an hour more than Francesa would typically spend on the Islanders. (As opposed to certain other outlets, ahem, that have chosen to cover this story and other important Islander-related matters, like the selection of a random eighties tune as the team's new goal song.) You can listen to Francesa's interview — all 28 minutes of it — here.